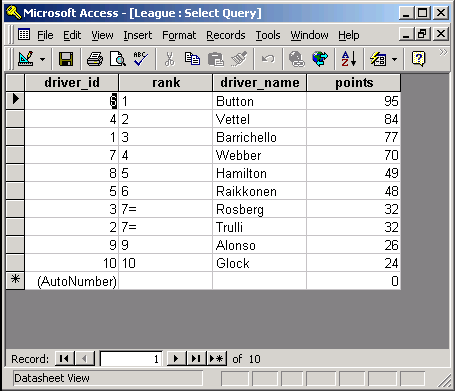 Here is a VBA function for Access 97 to automatically rank query results. It can be used to calculate the rank of each row in a query. Ties are worked out automatically, so you get, for example, 1, 2, 3=, 3=, 5. Download (zipped mdb file, Access 97 format). In the download is an example table and query. 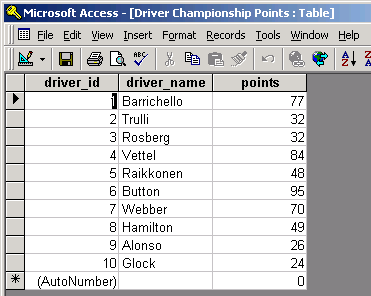 The table contains some names and numeric data field "points" which is to be ranked. 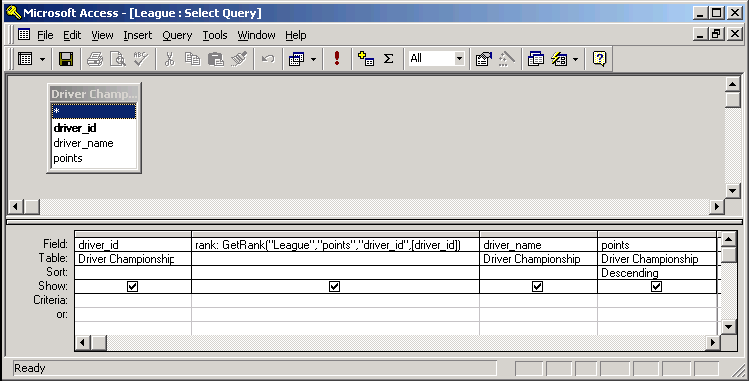 The name of the query in which the GetRank function is used, eg "League"
The name of the field which is sorted in Descending order, eg "points"
The name of the field which contains a primary key, eg "driver_id". A primary key is required. The primary key must be visible. If you have "Show" unticked the query won't work. The value of that primary key field, eg [driver_id]. Did this help you? Email phil[at]pjc.me.uk. Replace [at] with @ to email.